It is hard to think of another writer as great as Mark Twain who did so many things that even merely good writers are not supposed to do. Great writers are not meant to write bad books, much less publish them. Twain not only published a lot of bad books, he doesn’t appear to have noticed the difference between his good ones and his bad ones. Great writers are not meant to care more about money than art. Twain cared so much about money that what little he writes about his art in his autobiography is almost entirely, and obsessively, about the business end of things: his paychecks, his promotional tours, his financial disputes with publishers, his venture capital investments in publishing and printing technology. He stops and starts Huckleberry Finn over and again to devote vast amounts of his time and energy to losing $190,000 (roughly $4 million today) in a doomed typesetting machine, and nearly bankrupts himself. Great writers are expected to be interested in ideas; they should associate themselves with at least a few convictions. Apart from a frontier notion of freedom, Twain never met an idea he could not reduce to a joke. He doesn’t even appear to have been wedded to his own skepticism. At the very least, great writers are supposed to think that writing is an important, if not a sacred, activity. When Twain set out to write the story of his life, he found the written word wanting (“too literary”), and elected instead to dictate it. The book in question has been advertised and sold as the autobiography that Mark Twain wrote and declined to publish in his lifetime because the material was simply too shockingly honest. There are enough hoaxes in this claim to make Tom Sawyer blush. Twain didn’t write it; hardly any of it is shockingly honest; just about all the material in it has seen print in one form or another, either in biographies of Twain or in Twain’s own magazine work. The book weighs in at 736 pages printed in a microscopic font, which gives it the feel of a serious and deeply felt venture. For its editors, it clearly was; but for Twain, I’m not so sure. Twain’s dictations make up only about one-third of the book; the rest is excerpts from newspaper articles that Twain found interesting, transcripts of Twain’s after-dinner speeches, end notes, footnotes, notes on the text, explanatory notes, and so on. Even the putatively autobiographical bits are less autobiography than an elaborate exercise by an extremely crafty writer to avoid writing his autobiography. It is impossible to imagine anyone who isn’t being paid to do it reading the thing from start to finish. Even I, who still hope to be paid, hauled the book around for six months on business trips and vacations, and spent vast amounts of time staring at Twain’s random ramblings in minuscule type feeling resentful and vaguely duped—roughly the way I felt a dozen pages into the Personal Recollections of Joan of Arc-before I could summon the energy to wade deeply into it. But taken for what it is, rather than what it pretends to be, the book is great. What we have here amounts to the contents of Mark Twain’s attic: all the stuff that didn’t fit in the living quarters and that the man tossed upstairs, where for a century it gathered dust, cobwebs, and rumors. A team of editors at the University of California, Berkeley, moved by a passion for accuracy wholly alien to their subject, went to work on this mess and have rendered it, if not comprehensible, at least inspectable. Here is the headline: if you thought Mark Twain’s character improbable for a Great Writer, wait until you see what he left in the boxes upstairs. Or, to put it another way: if all you knew of Mark Twain was this curious self-presentation, you would never believe that any grown-up person would be interested in his literary output a century after his death. FOR A START, Twain himself was not exactly a grown-up, at least not a willing one. He made his name first as a magazine writer with a tale of derring-do about the survivors of a shipwreck who had spent forty-three days adrift at sea. He wrote his best books about riverboat pilots and gold miners and boys searching for adventure. If there had been pirates or cannibals anywhere near Hannibal, Missouri, Twain would no doubt have written about them, too. He had a Pixar-like ability to transform what appeared to be a children’s adventure story into a grown-up work of art—but preserved as a kind of excuse the appearance that he had written nothing more than a story about and for children. He seems to have arranged to be treated as a child as often as possible. The role that he carved out for his wife, for instance, was less spouse than custodian: he played Tom Sawyer to her Aunt Polly. Her chief function, to judge from his account of her here, was to prevent Twain from getting away with being who he naturally was. He allowed her to excise all jokes, phrases, and sentiments from his books that she deemed to be in poor taste. Her nickname for Twain was “Youth,” because “I had certain mental and material peculiarities and customs proper to a much younger person than I was.” One such custom was his habit of leaving a mess behind him for others to clean up. He can’t go camping beside Lake Tahoe without setting fire to the forest. When he gives a match to a drunk in the local jail, the drunk uses it to burn down the jail, with himself inside. When he dabbles in venture capitalism—funding the creation of one-handed grape shears, perpetual calendars, a cloth made from peat—he creates commercial mayhem. A rich businessman friend is called in to sort it all out. I was the cause of the child’s illness. His mother trusted him to my care and I took him [on] a long drive in an open barouche for an airing. It was a raw, cold morning, but he was well wrapped about with furs and, in the hands of a careful person, no harm would have come to him. But I soon dropped into a reverie and forgot about my charge. The furs fell away and exposed his bare legs. By and by the coachman noticed this, and I arranged the wraps again, but it was too late. The child was almost frozen. I hurried home with him. I was aghast at what I had done, and I feared the consequences. I have always felt shame for that treacherous morning’s work and have not allowed myself to think of it when I could help it. I doubt if I had the courage to make confession at that time. I think it most likely that I have never confessed until now. That chilling anecdote is the beginning of the story of the death of his first child, his only son. It is the most sincere expression of remorse in an autobiography filled with moments of phony remorse. But even this passage feels to me, I don’t know, undigested—less an expression of deep torment than of a desire to shed an unpleasant memory. Perhaps that’s unfair. Mark Twain describes his adventures as a Mississippi pilot as though he had been a boy of about seventeen at the time, whereas in fact he was a young man of nearly thirty. There is a reason for this. The same part of the book [Life on the Mississippi] describes his exploits in the Civil War, which were distinctly inglorious. Moreover, Mark Twain started by fighting, if he can be said to have fought, on the Southern side, and then changed his allegiance before the war was over. This kind of behavior is more excusable in a boy than in a man, whence the adjustment of the dates. Whenever Twain writes about himself, and especially when he writes about his childhood, the reader senses that he has been invited to participate in a delightful fiction. In these dictations, Twain says several times words to the effect that “when people write their memoirs they do nothing but lie and puff themselves up. Because I will be speaking directly to you from the grave, with nothing to lose, this will be the first deeply honest autobiography.” But he isn’t any more interested in simple, artless honesty in death than he was in life. Honesty, for Twain, was not a virtue, and it was certainly not the best policy. It was a tool in his toolkit, to be used from time to time, when the occasion called for it. It was a summer afternoon and just the kind of weather that a boy prizes for river excursions and other frolics, but I was a prisoner. The others were all gone holidaying. I was alone and sad. I had committed a crime of some sort and this was the punishment.... I had one comfort, and it was a generous one while it lasted. It was the half of a long and broad watermelon, fresh and red and ripe. He was the best boy in the whole region. He never did harm to anybody, he never offended anybody. He was exasperatingly good. He had an overflowing abundance of goodness—but not enough to save him this time. I watched his approach with eager interest.... His form became more and more foreshortened. When he was almost under me he was so foreshortened that nothing of his was visible from my high place except the end of his nose and his alternately approaching feet. Then I poised the watermelon, calculated my distance, and let it go, hollow side down.... He had about six steps to make when I let that canoe go, and it was lovely to see those two bodies gradually closing in on each other.... That shell smashed down right on the top of his head and drove him into the earth up to the chin. The chunks of that broken melon flew in every direction like a spray, and they broke third-story windows all around. They had to get a jack such as they hoist buildings with to pull him out. I wanted to go down there and condole with him, but it would not have been safe. It is so good, and so perfectly as you expect the young Samuel Clemens to behave, that you don’t care exactly what really happened, or why. Whatever license he took didn’t improve just the story, it also improved Twain. He was a master at selling himself as the character who behaved badly, by choosing his vices carefully, so that they were acceptable to a wider audience. He was the felon who charmed the cops by confessing to misdemeanors. “That’s just like him!” you can hear his audience say, as he tells yet another story that seems to reveal his character, while hiding it. And maybe it is him: at some point in life you are who you pretend to be. But it is hard to know if that is who Twain was, or just who he thought people would reward him most for being. By the end of his life, Twain was so much more obviously interested in his celebrity than in his craft that his craft seems no more than a tool for preserving his celebrity. The more he had to lose, the less he had to say. But just as there are weaknesses in every strength (say, a gift for identifying moral failings in others), so there are strengths in every weakness. Writing with one eye on the audience is certainly a handicap; but the worry that the audience might rise and leave the auditorium at any moment pushes the writer to be clear, and brief, and obviously worth listening to. He is forced to pay special attention to the sound of his words. A distinctive literary voice is a bit like a talent for wiggling your ears, or for holding your breath underwater for two straight minutes. It’s not fair that some people simply sound particularly themselves and others do not, and it’s really not fair just how particularly himself Twain sounded, even when he lay in bed and rambled to a stenographer. But Twain’s voice is the reason people still read him. His voice is the reason you feel as if he is talking to you. And the crowds he played to in his lust for fame and fortune helped him to create that voice. Paige [the perfectly nice man who invented the typesetting machine that cost Twain a fortune] and I always meet on effusively affectionate terms; and yet he knows perfectly well that if I had his nuts in a steel-trap I would shut out all human succor and watch that trap till he died. All creatures kill.... Man is the only one that kills for fun. Yet anger of the sort that Twain felt near the end of his life—bitter, resentful, painful anger—did not suit the character he had created for himself to play. He buried not only his wife, but also three of his four children. He felt cheated or swindled by some large number of his business partners. He had lost faith in pretty much everything, and was uninterested in consoling and distracting himself with social and political causes. He wore his white suit everywhere he went, but his inner life had been stripped bare. A writer less invested in his own caricature might have responded more richly to the sadness of the passage of time. An ideal Twain might have lost his boyishness and become more recognizably grown-up. In sum: if he had been a better character, he might have become a greater writer. That’s the theory, anyway. But I’m not so sure. 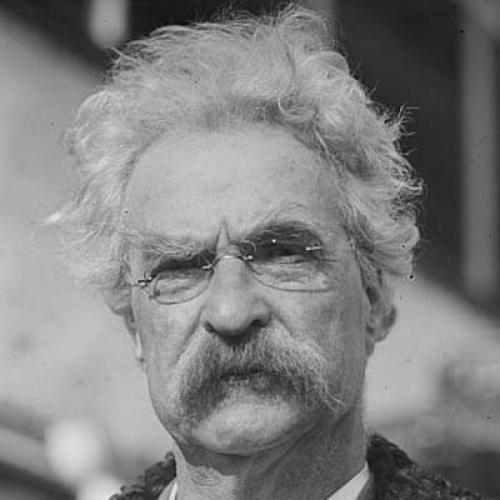 If Twain had been a less slippery character, he’d have been a different character, and if he’d been a different character, he’d never have been the writer he was. He might not have ruined the ending of Huckleberry Finn, but only because he would never have written it in the first place. Michael Lewis is a contributing writer for Vanity Fair and the author, most recently, of The Big Short: Inside the Doomsday Machine (W.W. Norton). This article originally ran in the July 14, 2011 issue of the magazine.